Have you ever thought how wonderful it would be if you could conduct your own astronomical experiments right from your laptop computer? Or have you ever dreamed of being able to access the same telescope data that professional astronomers use in their research? Yea, me too! As a physics groupie, I’ve always wanted to be able to contribute some original research in the field of astronomy, but as an independent researcher with no formal ties to a university or research institution, I don’t have the luxury of submitting requests for time on the Keck telescopes up on Mauna Kea. Fortunately, there is now something called the Sky Server. The Sky Server is an incredible public resource allowing anyone with an interest in astronomical research to play an independent role. The Sky Server is an open and free repository of astronomical data provided by the widely respected Sloan Digital Sky Survey (SDSS). All you need to use the Sky Server is a computer and an Internet connection. All experiments are performed online. You access the repository using the SQL (structured query language) database query language. The site publishes the database schema (an organization of related data tables) and data dictionary describing many of the data elements available to you. It is a perfect resource for anyone with a relatively deft knowledge of database systems, and with all the tutorial information made available to the public, you can get up to speed with modest effort. The site even provides problems to solve for high school students as well as more advanced users. I enjoy using The Sky Server very much and it has become my favorite research tool. I like thinking up different experiments to conduct. 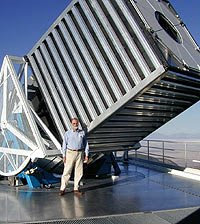 In most cases, I need to research how to use the SDSS data to complete the experiment. This frequently involves an understanding of the science behind the data, which often requires reading research papers upon which the data are based. I find this aspect exhilarating because it provides the structure for real life science. The Sky Server provides a series of twenty somewhat complex SQL queries that were devised by other users. I use these queries as models for other queries I think up, but sometimes I need to start from scratch and write my queries from start to finish. SDSS is a collaborative research project making the most complete map of the skies visible from the Northern Hemisphere. Microsoft Corp. is a major supporter of SDSS and the Sky Server. Microsoft’s database guru, the late Jim Gray, helped develop the database portion of SDSS so as a result The Sky Server is built on Microsoft technologies such as the SQL Server relational database. To me, using The Sky Server is a dream come true. I can access the SDSS database from anywhere, at any time from my wireless laptop computer. Doing science has never been such a pleasure. I highly recommend this valuable resource to all Science Lifestylers.